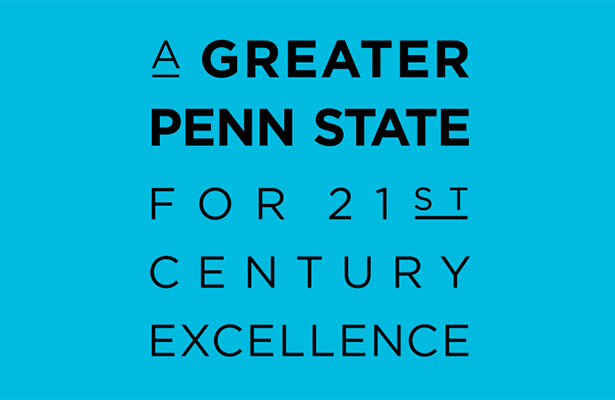 Penn State is ready to commit to truly great—to enable the extraordinary culture of Penn State to reach an enduring level of excellence that defines a public land-grant university in the 21st century. No institution offers a more powerful example of philanthropy’s impact than Penn State. No institution has greater potential to transform philanthropy from commitment to impact. Penn State embarked on a new fundraising campaign, "A Greater Penn State for 21st Century Excellence," the summer of 2016 and the University is asking Penn State’s alumni and friends to become our partners in fulfilling the three core imperatives of a truly great public university: Open Doors; Create Transformative Experiences; and Impact the World.